Possibly the most important thing that these forgotten people carry with them each day. It’s important to help them maintain it. When visiting a site, the Care4Calais team often set up a generator, four camping chairs, a power bank, four electric hair clippers, scissors and accessories, and within minutes you can be guaranteed that four skilled barbers will emerge from the crowd of refugees and start their work. The mobile barber shop is an amazing sight. A crowd will gather to watch as the barbers take great care to give their refugee “customers” a good cut. Those who are waiting, chat, hold mirrors and scissors for the barbers and brush trimmed hair off the client’s shoulders. The discussion is social, friendly, encouraging. Just like a barber shop in a city. Nobody minds waiting their turn. On this particular afternoon we were in Maximilian Park, Brussels. Over 400 refugees reside there. Mainly Eritrean and Sudanese. Around 30 people were waiting their turn for a haircut. A Moroccan man of about 70 approached the group tentatively. 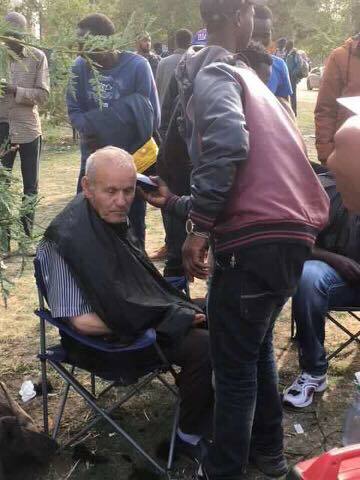 He wasn’t a refugee, but he was looking lost, tired and was drawn by the activity and the atmosphere of the mobile barber shop. As soon as they saw him, the other men moved aside and helped him sit down. Someone offered him their apron to cover his shirt, and the barber began to gently cut his fine hair. When he stood, someone brushed the hair from his collar and the next “customer” took their seat. “Do you know him?” I asked. “No, but he is an older man to be respected” one of the men replied. I watched the old man walk away, his hair clipped and his shoulders straight. These men, refugees with so little themselves had helped him maintain his dignity.